Very few games come out of nowhere and absolutely stun the gaming industry. In this age of commercial hype and the internet, it's even more uncommon. 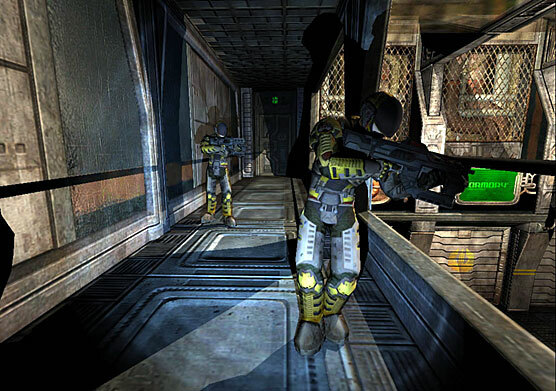 Then you have the Chronicles of Riddick: Escape from Butcher Bay, one of those games that blindsided everybody with immense graphical prowess and unique non-run-and-gun gameplay. It's not perfect, but it is certainly turned out better than anyone could have imagined. 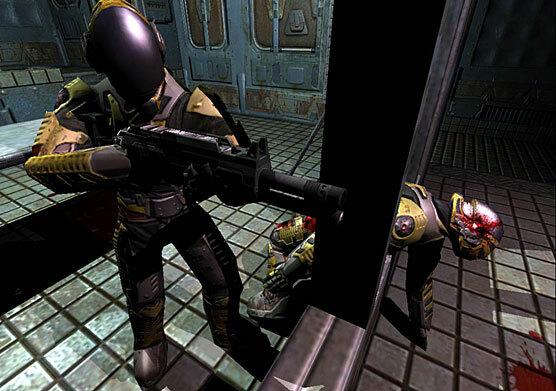 Players take control of Richard Riddick, voiced by Vin Diesel. His goal is obvious from the title: Escape the triple-maximum security prison anyway possible. However, this is not just an ordinary jail. You're actually allowed to roam throughout the yards, talking to various inmates. You'll be able to take on various side quests by talking to the right people. Step out of line and either a guard or the security system will gun you down. This is why stealth is so important. Fairly early in the game, Riddick will earn his famous "eye-shine" ability from Pitch Black, the movie that first introduced the character. Once this is done, turning off (or shooting) the lights will prove to be no problem for the anti-hero. A simple click of the right analog stick allows you to see everything clearly. However, should a light be turned on, prepare to be blinded. Ducking down in the dark makes you virtually invisible to guards and should you play everything right, this will allow you to "stealth kill." You can snap the guard's neck, stab him in the throat, or perform various other grisly killings once you're in position. You can even drop down on top of the guards and take them out. Should the kill fail or you get caught, it is extremely hard to survive a straight on battle against an assault rifle, so finding another place to hide is almost a necessity. Of course, you can always turn the enemies weapons against them with a tap of the left trigger. 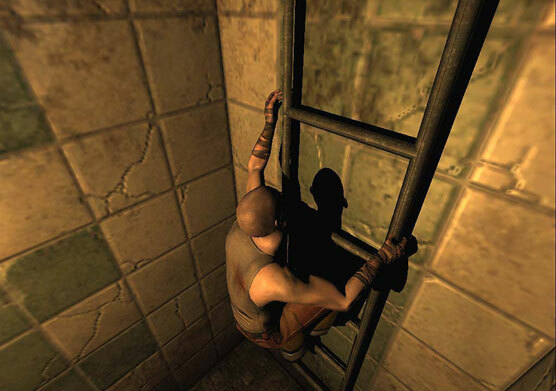 The first-person view that makes up most of the game will switch into 3rd person when climbing ladders, when you need to lift yourself up onto boxes, and to shimmy across some pipes. This makes climbing ladders so easy and controllable it is actually revolutionary. You'll never fall down a ladder simply because you thought you were holding on. More FPS games need to do this or find a way to make it easier. You'll actually spend a good part of this roughly 10-hour romp without a gun. You'll be forced to look for shivs, screwdrivers, pipes, and other makeshift weapons to survive. Of course, you can almost always avoid confrontations if you're stealthy enough. Should you get stuck and be forced to fight, the excellent first-person fighting engine is better than most stand-alone fighting games. Using a combination of the right trigger and left analog stick, you can perform various bloody combos with either a weapon or just your fists. Better be sure that no one else is around to hear the fight, as guards are quick to respond. Human guards are of course not the only enemy you'll come across. All the cameras in the prison are equipped with heavy firepower and once into the pit early on in the game, you'll be stuck fending off a race of disgusting little people who explode when shot. Guards are also equipped with heavily armored mini-mechs that can only be taken down when their weak spot is found. Late in the game you'll be up against another set of creatures along with guards, but revealing their identity would be spoiling some of the fun. Chronicles is an immersive experience, made so much better by the little touches. There is no display to tell you how much ammo you have (that is always seen on the gun itself) and your life bar only appears when it is affected. Guards and inmates carry on conversations and listening carefully will reveal some very funny stuff. Vin Diesel lends his own static acting to the game along with Ron Pearlman and rapper Xzibit. Language here is coarse and is definitely not for the younger set. The games new graphical engine employs "normal mapping," a way to dress low-polygon models in highly detailed textures to make them look better than a character with a high polygon count. This keeps the framerate high and the game running smoothly. The lighting here is fantastic, though there are times when it really is too dark. The surroundings look utterly amazing, easily on par with the hyped Doom 3 which comes out later this year. However, some of the graphics are way off the mark. The game hardly uses any anti-aliasing and some rooms look like their running on the PS-One. Everything gets blurry and jagged and some of the character models have trouble staying together. The realtime cinemas are the worst of the package. They end up being a blurry mess of pixels and hardly fit with the rest of the game. Some of this will not be noticeable unless your playing the game on a HDTV in progressive scan that really shows the lower resolutions used. Other people may not have a problem with this. To make up for some of the graphical mishaps is the sound. As mentioned before, the voice acting is just superb. The soundtrack only kicks in when the action does giving the action scenes a boost of adrenaline. Gunfire is spectacular, especially in full 5.1 surround. You'll hear bullets ricochet off walls and enemies yelling from all angles. When you're in stealth mode and a guard is close, your heart will begin to beat and become louder the closer he gets. This really increases the tension during these moments. This is one of the best sound presentations on the market today. The game does suffer from a few major problems that may turn off some people. The most obvious is a complete lack of any multi-player modes. Though the game is X-Box Live aware, don't make any plans of joining the community in Riddick deathmatches. This obviously cuts down on the replay value considerably and the only real reason to go back is to pick up packs of cigarettes, which unlock various features. These can be obtained by completing side missions or simply looking around in odd places. The save system is also a bit ridiculous and will frustrate some people when they figure it out the first time. 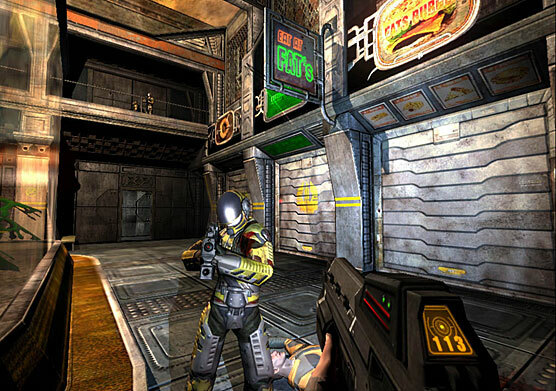 The game is auto-saved at 36 various checkpoints throughout the game. Though "saving" may appear at the top of the screen, this is only saving a spot for you to return to should you die. Moving into a new checkpoint is the only way to save the game. You'll usually know when this happens as a cinema leads the way into the new section. Some of these areas are quite large so this can get irritating. Overall, this is a wholly unique shooter with great production values and immersive story. This is easily one of the best movie licensed titles in a long time and will likely be the best one of this console generation. Any fan of first-person shooters needs to play this game and if you enjoy games like Splinter Cell for their stealth gameplay, this is also a must-play. The lack of any real replay value is obviously going to make or break your decision on a purchase though.